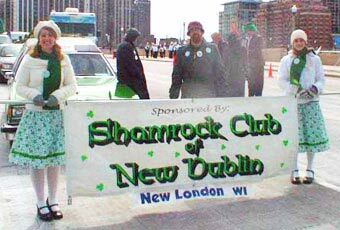 The Shamrock Club of New Dublin is based in New London, WI, USA. We have monthly meetings and plan St. Patrick’s Day festivities each March when we rename the town from New London to ‘New Dublin’. The weeklong schedule includes a night of Irish entertainment, Irish caroling, a good old fashioned Irish wake, an Irish Céili, and is topped off with a Grand Parade and an Irish Fest. Our purpose is to bring together individuals of Irish descent or relationship (or those that wish they were) for the purpose of celebrating being Irish. The club usually meets the first Monday each month 7:00 pm at New London Lanes meeting room at Hilby’s on the bowling alley side. Membership is open to all. If interested in becoming a member, come to a meeting, or contact us via email for more information. The membership fee is $15.00 per year per family or individual.